DM-Mobile from Dryer Master: Adding mobility and peace of mind to your drying season. DM-Mobile brings true real time remote moisture monitoring and drying control to the grain industry. With DM-Mobile you can view real time moisture and drying information (including alarms) as well as up to 24 hours of historical data. You can also even make changes to moisture and rate set points all directly from your browser. Now you no longer always have to be close to the dryer to know what’s going on. Why not try out DM-Mobile at my.dryermaster.com (log in: demo, password: demo). If you are not yet familiar with the DM510 you might want to take a minute to read the help page for a quick run down of DM-Mobile’s features. 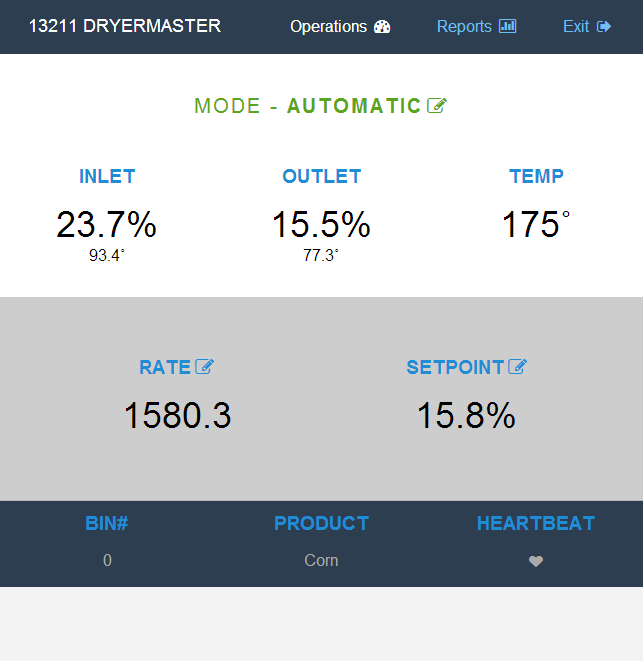 To help promote this valuable new feature Dryer Master is adding DM-Mobile as a standard component to its industry leading DM510 computerized drying control systems at no additional charge for 2014. If you would like to learn more about the DM510 and how it can add profits and peace of mind to your next drying season why not check out our product page on our web site or one of our DM510 training videos on our YouTube channel, or even better give us a call at 1-888-318-0009 (toll free in North America) or at 1-519-725-4700. This entry was posted in Agriculture Industry News, Control Technology, Drying, Grain Drying, Moisture Sensors and tagged DM-Mobile, DM510, grain dryer control, grain dryers, grain drying, mobile monitoring, moisture control, remote monitoring.